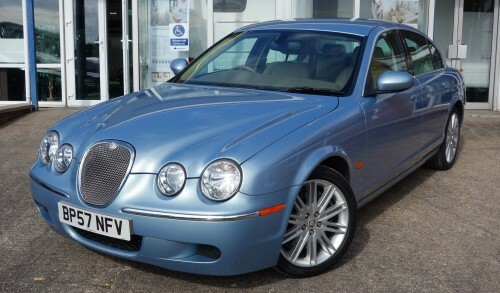 Superb Two Owner Very Well Looked After Diesel 2.7 S-Type Auto SE, FSH, One Lady Owner Since Jan 2008, Finished In Beautiful Frost Blue With Full Light Barley Leather & Sapelle Bronze Veneers. Full SE Specification Including Factory Touch Screen For Satellite Navigation, Audio, Telephone & Climate Control, Electric Memory Seats With Lumbar Support, Electric Multi Function Steering Column With Controls For Cruise, Voice Activation & Stereo Radio/CD Player, Self Dim Interior Mirror, Blue-Tooth Phone System, Electric Windows, Dual Zone Climate Control/Air Conditioning, Park Assist, Remote Central Locking & Boot Opening, Auto On Wipers & Lights, ABS Brakes, Traction Control, 18″ Factory Triton Alloy Wheels With Correct Nearly New Pirelli Tyres, Alarm/Immobiliser, Dynamic Stability Control, Trip Computer, Driver/Passenger/Side Air-bags, Split Fold Down Rear Seats, Cup Holders, Front/Rear Armrests, Full Size Spare Wheel, Full Book Pack, Two Keys/Remotes. 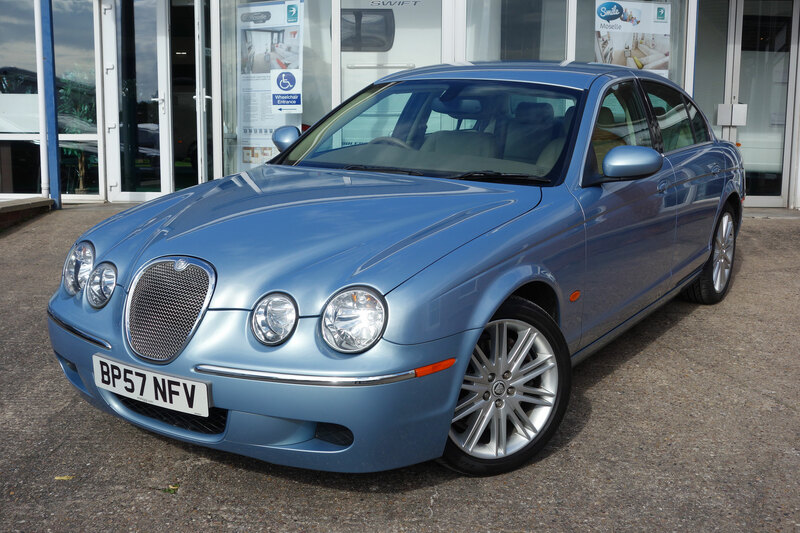 …ONE OF THE NICEST DIESEL S-TYPE’S WE’VE SEEN FOR A LONG TIME…ONE LADY OWNER SINCE JAN 2008..,FULL SERVICE HISTORY WITH 8 STRATSTONE JAGUAR STAMPS LAST AT 34,000M…PASSENGER & REAR SEATS LOOK LIKE THEY’VE NEVER BEEN SAT IN…CAPABLE OF 45MPG…MOT’d NO ADVISORIES & READY TO GO..VIEW BY APPOINTMENT ONLY PLEASE…CALL DAVE HOOPER..EASY TO FIND NEXT TO A50 CLOSE TO M1 J24/25..PICK UP FROM EAST MIDLANDS AIRPORT..RAIL STATIONS DERBY, LONG EATON & EAST MIDLANDS PARKWAY..